Versatility is what the AX3G is about and Korg has come up with a unit that can be all things to all users. This is something that you can mess about with at home but can also slot into your pedal board for use as a tuner and to supplement your effects. Okay, there may be minor issues about build and editing but for £59, what´s not to like? Compact. Facilities for both stage and home use. Editing not totally intuitive. Power supply not supplied. Korg is well known for putting amp simulation and effects into compact and portable practice and recording packages, typified by the Pandora personal effects processors and the diminutive Ampworks unit. The same REMS modelling technology is also used in the AX series of floor pedals for onstage use that up to now have been considerably larger. However, this latest incarnation of the AX series processors seems to bridge the gap between the two strands. While still presented in stompbox style with footswitches, the AX3G is smaller than previous AX pedals and as much at home on a tabletop as the Ampworks is. What you get is a battery-powered pedal that can fulfil the home recording and practice functions of the Pandoras but is also adequately equipped for the practicalities of stage usage. The AX3G has 80 programs onboard; 40 are user-editable for storing your own sounds. Each program is made up of a chain of editable effects blocks - pre-FX, drive/amp, cabinet, noise reduction, modulation, delay/reverb. You can choose the specific effect for each block from an onboard total of 57 varieties. Each effect has a main parameter and up to five adjustable sub-parameters so there´s scope for subtly tweaking the factory presets or creating your own sounds from scratch. Physically, the AX3G has a plastic casing that, while not in the same league as diecast metal when it comes to the rigours of live use, nevertheless feels solid enough. The two footswitches have different uses depending on the mode you are in but will mainly be used to move up or down through the range of presets. Pressing both together kicks in a very useful chromatic tuner, and either bypasses the unit or mutes the complete signal depending on whether you press them momentarily or hold them down for a second - a single push on either footswitch disengages the mode. In edit mode the footswitches can be used to bring up the current effect type/ parameter and its parameter value for quick reference. The editing functions are taken care of with the pair of cursors, rotary switch and rotary knob. Output is via a single TRS jack socket that can send a stereo signal to headphones or mixer or (used with a standard mono lead) send the output straight to your amp - one of the Amp sub-parameters lets you set the output EQ curve to match a line input or one of three generic amp types. An additional socket allows the use of an expression pedal to control volume or wah among other parameters. 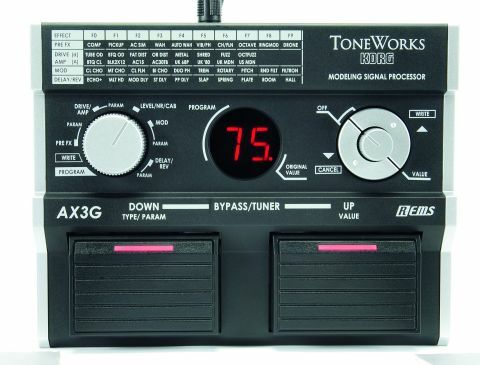 Anyone who has used previous Korg modelling processors will know what to expect with the AX3G - contained within each is a comprehensive range of usable sounds ranging from excessive high-gain metal amps to acoustic simulations, with all the shades in between. There are just eight amp models, but they cover useful Fender, Vox and Marshall territory and more - while the eight drive effects don´t miss much in the way of generic distortion types. The standard modulation effects are crisp and floaty - particularly when heard on stereo headphones with a bit of delay or reverb ambience dialled in - and the various wah, pitch and filter options offer plenty of gritty choices. The programmers have put in time on the presets to present a little something for everyone, so no matter what your style there are plenty of reference points to start you off fine-tuning your own sounds and saving them. The editing process is easy enough. One rotary switch position selects the effects block so you can choose the amp model or effect with the cursors and adjust one main parameter value with the rotary knob. Moving to a second rotary switch position allows you to access the sub parameters for the block and their values in the same way. The necessarily small display only has two characters, so each effect and parameter is abbreviated (amps A0 to A7, parameters P1 to P5 etc). So editing isn´t instantly intuitive as you have to check the manual to see what each parameter is until you get really familiar with it. Get editing, though, and you can save a bunch of sounds with amp sims for home practice or recording and another set of pure effects for kicking in onstage.